Holmsbu Hotel & Spa is a true gem, whatever the season, located right by Oslo fjord and surrounded by charming boathouses and beautiful villas. With its own sandy beach, jetty and marina this is just the place for you if you love being close to the sea. Experience Norwegian coastal scenery and treat yourself to a moment of calm in our spa. Oslo is just an hour away from our hotel paradise, which means getting to and from Holmsbu is always easy however you choose to travel. At Holmsbu Hotel & Spa our spa is sensitive to your physical and mental well-being. Our spa Holmsbu Spa is made up of three areas; spa treatments, gym and relaxation area (water area). 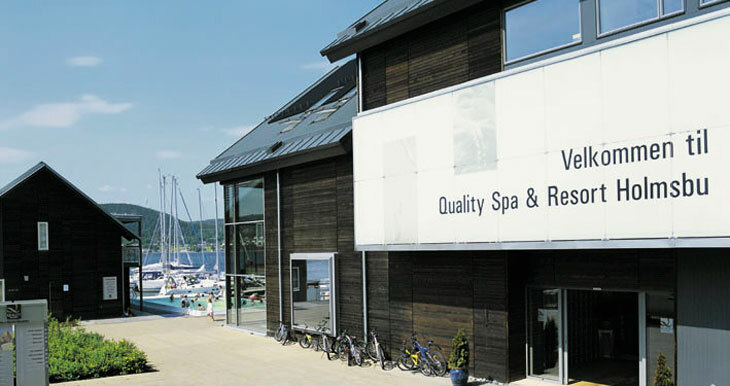 Here we have 12 treatment rooms, a 265 m2 gym with all the equipment needed for a rewarding session, indoor and outdoor pools and Jacuzzis, steam bath, sauna with views over the fjord, cold-water pool and relaxation areas. Our conference rooms can accommodate up to 250 people. Villa Holtnes also makes up part of our conference area and takes groups of different sizes. You can also organise other functions in Villa Holtnes if you have something special to celebrate. If you choose to hold your conference at our hotel, then there's every opportunity to combine hard work with a relaxing spa experience, or be inspired by the spectacular archipelago scenery and boost your energy with a wide choice of activities. We have hotel rooms to suit all occasions. Here you can choose to stay in a suite with sea views, or in your own boathouse or villa. Whether you're here for work, family, friends or a loved one, we have the perfect option to suit you. If you're arriving by boat, we have our own guest jetty and marina. Beauty is often found in simple things. A stroll in the fresh sea air along a jetty. A hot latte or glass of wine here at our hotel or in a café in Holmsbu centre. Holmsbu Billedgalleri is located between our hotel and Holmsbu centre and is where Holmsbu artists, with Henrik Sørensen at the forefront, exhibit their work. The centre is buzzing with life with its busy cafés and shops. The pace drops off in the town during the winter months, but its character remains intact all year round. The Holmsbu Hotel & Spa is cash-free, which ensures added security for our guests and visitors. More information about this can be found under FAQs. Train to Drammen or Oslo, and then bus to Holmsbu.